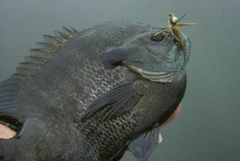 I developed the HairyMara Slider a number of years ago as an alternative to the Deer Hair Bugs and Divers that I often use in the shallows for Largemouth Bass. It was a lot easier to cast, and it turned out to be a great fly for both bass and large bluegills. 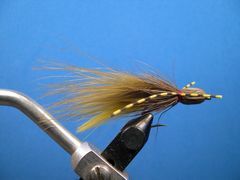 I tie the HairyMara Slider on size 4 through size 8 hooks. 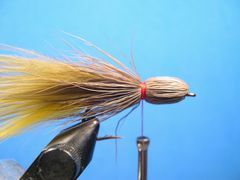 When tied on a size 4 hook, the size I most often use for bass and bluegills, the finished fly is about two and one-half inches long. A size 6 HairyMara is about two inches long and the tiny size 8 is about one and one-half inches in length. 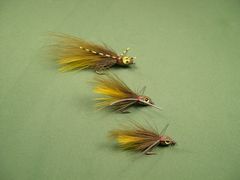 So, don't hesitate to tie up some of these guys in all three sizes. Sometimes, especially in gin clear water on calm days, the smaller sizes work best. And, if you like using ultra-light fly rods, the size 8 is a perfect match. Of course, on the smaller sizes, you will want to scale down the eyes and the legs. Doll Eyes come in four sizes - 3mm, 4mm, 7mm, and 10mm. Tarantu-legs are also available in a smaller size. I like to use doll eyes because they offer some boyancy to the fly. But solid plastic animal eyes or 3-D Molded plastic eyes would also work. And, don't hesitate to subsiitute other leg material for the Tarantu-legs. The fly is a pretty straight-foward tie. The steps that you have to follow, "to the tee," are the steps for painting the head with Dave'e Flexament and gluing the eyes in place with Household Goop. If you don't follow the instructions, the eyes won't stick to the head. If you're not familiar with Dave's Flexament or Household Goop or how to use these two great cements, visit the "Glues and Cements" page. Fish the HaraMara Slider like you would any other topwater offering. Cast it out and let it set for a moment or two, then fish it back to you with a short strips followed by brief pauses. If you're using a floating line, cast it into pockets and cuts in the weedline. Casting it, as close as possible, parallel to the weed line is also productive. If you're using a sink-tip line, make two-foot pulls to take the fly down a couple of feet followed by a pause. You will often get a strike as the fly is moving back toward the surface. 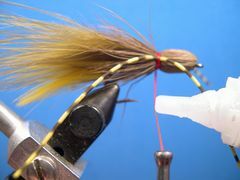 To give the HairyMara as much action as possible, attach the fly to your leader with a Duncan Loop or other fixed loop knot. If you're not familiar with the Duncan Loop Knot, click on the "Warmwater Knots" page. Clamp the size 4 Mustad 3366 hook in the vice and crimp the barb. Attach the thread at the hook's point. 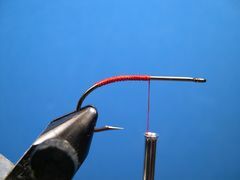 Lay down a thread base back to the hook's bend then back to exactly 3/16th inch forward of the hook's point. If you were tying the smaller size 6 or 8 HariyMara's, return the thread to 1/8th inch forward of the hook's point. 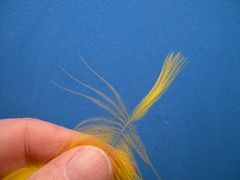 Select a yellow marabou plume for the tail and stroke back the fronds to expose about one-inch of the tip. Cut out the tip with your scissors. Removing that much of the tip and the stem makes the marabou tail more flexible which gives the fly more life-like movement. 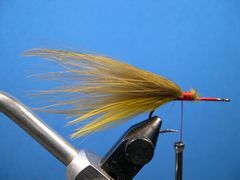 Tie in the marabou tail. The tail should extend beyond the hook's bend by a length equal to one and one-half times the hook's length. 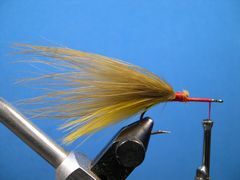 Align the butts of the marabou with the front of the thread wraps and bind down the marabou back to the hook's point. Select an olive marabou plume for the wing. 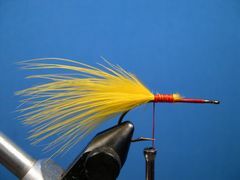 Prepare it in the same way that you prepared the yellow marabou plume in Steps 2 and 3. 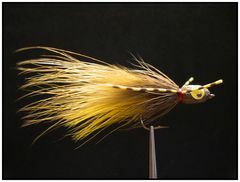 The olive marabou wing should extend beyond the yellow marabou tail. On a size 4 HairyMara Slider that would be about one-half inch. Scale it back on the smaller size 6 and 8 HairyMara Sliders. 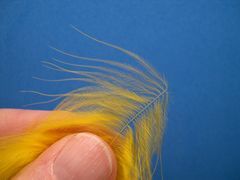 After you have measured the olive marabou wing for proper length, align the butts with the front of the yellow marabou butts. Tie it in with tight thread wraps back to the hook's point. 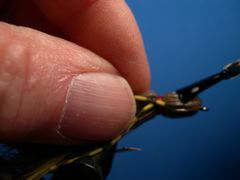 Move the thread down to the bare hook shank and lay down a good base of thread up to the hook's eye in preparation for tying in the head and skirt. 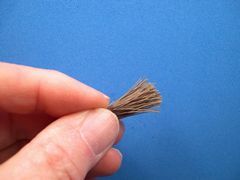 Cut a clump of deer hair from the hide that is about lead pencil thickness when it's compressed between your fingers and comb out the underfur. 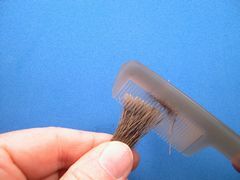 Even the tips of the deer hair in a "hair stacker" and trim the deer hair butts. The deer hair bundle should be about one and one-half times the length of the hook. 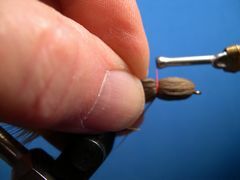 With the thread hanging just behind the hook's eye, align the deer hair clump. 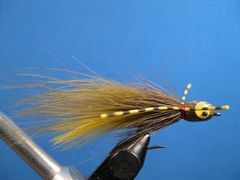 The deer hair tips should protrude over the hook's eye with the butts butted up against the tail and wing wraps. 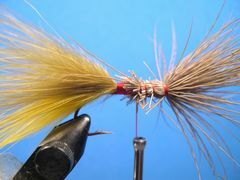 Bind down the deer hair butts by making three or four very tight wraps of thread around the deer hair clump at the front of the eye, followed by tight close wraps back to the base of the wing. Be sure the thread is hanging at the base of the wing. 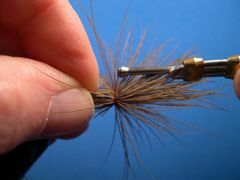 Stroke the deer hair tips back with the fingers of your left hand and bind them down with several wraps of thread. After you are satisfied that the head is well formed and the deer hair skirt looks right, make several wraps of thread to expand the space where the legs will be placed. Move the thread to the center of that space in preparation for tying in the legs Madam X style. Tie in one piece of leg material on the far side of the fly with a couple wraps of thread followed by one piece of leg material tied in on the near side of the fly. 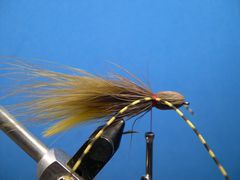 Tie off the legs with a Zap-A-Gap Knot. To make a Zap-A-Gap Knot, simply coat about one inch of thread nearest the hook with Zap-A-Gap and wrap the wet thread over the existing thread wraps. Let the glue dry for a minute or so and clip the thread. That's all their is to it. Trim the front legs so that they extend slightly beyond the head. Trim the back legs so that they extend to the middle of the wing. Pull the front legs out of the way and paint the head with a liberal coat of Dave's Flexament thinned almost to the consistency of water. If you're not familiar with Dave's Flexament or how to use it check out "Glues and Cements." You will also use an adhesive called Household Goop in the next step. Check it out too! Put a small amount of Household Goop on the eyes with a toothpick and position them on the head. Your HairyMara Slider is ready to be fished. Good luck!